One of the nice things about having the race start pretty close to home was that I didn’t need to get up at a ridiculous hour to get ready. I was able to get up pretty close to my usual time (which I have been told might be considered a slightly ridiculous hour anyway), have some peanut butter pretzels, get dressed, and head out the door. K drove me to the drop-off point, and from there it was a pleasant enough walk to the corrals. I was in corral 16. Everyone was in a good mood, which is always nice. I saw a few other shirts from One More Mile, and got some compliments on mine. We crossed the starting line nearly 30 minutes after the gun, and ran a few miles through Griffith Park. I went out a little faster than I intended, running the first three miles in 11:25, 11:3, and 11:18. That was with planned walking breaks, so I know that when I was running, I was running a little faster than I should have been. And then the hills came, and the walking breaks started getting longer, and I stopped caring about smiling for the cameras. It really was a nice course, though, despite the hills. The water stop volunteers were smiling, and I heard a lot of people thanking them as we went through. The bands were entertaining. There were a bunch of different spirit groups, including one that I think was made up of the cheerleaders from Temple City, but I’m still not sure. And, once we left the park, there were lots of people gathered along the streets, cheering us on. I saw a lot of great signs; I think my favorite was the one that said, “That’s not sweat, it’s your fat cells crying.” The most memorable, to me, was one that said, “Run, B****, Run” – without the asterisks. I really, really, REALLY hope that someone asked him specifically for that sign. And also that he figures out for the next time that maybe the rest of us won’t find it quite so amusing. Somewhere in mile 10 – I think, and it was my slowest mile (14:54) – there was a man holding a sign that said, “You’re doing great! Big hill ahead!” I hoped he was joking, but then I turned the corner, and there it was, just as he said, a big hill for our tired legs to slog up. In mile 11, I think, there was a little girl sitting on the curb with her mother, a cooler full of water bottles in between them. I took one gratefully. It had been a while since the last water stop, and my Nathan handheld bottle was empty. So, thanks, whoever you were! Once we reached downtown L.A., I started counting down the streets. I knew the finish line was near 11th, and we entered on 3rd (I’ve driven into the city that way many, many times over the last eight years on my way to the Central Library, so this amused me a lot). Of course, a few blocks from the end, we had to turn and do a little zigging and zagging to finish out the last mile. My Garmin, which had been counting down from 13.1 as a “quick workout” decided about a quarter mile from the finish line that I had reached the goal, and stopped recording. Oops. 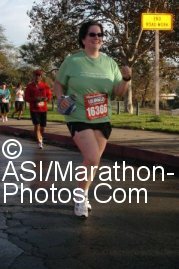 I perked up a lot once the end was in sight, and ran across the line with a smile for the camera. A race volunteer hung the medal around my neck (backwards). After slurping down a bottle of Cytomax (in retrospect, not the best idea, I should stick with water next time), I went for the posed medal shot. In the secure area, there were lots of munchies (mmm, bagels) and cold, cold water. I never made it to the various booths at the Festival. I called K to let her know I was done and that I would be inside ESPNZone, because the insanely loud amps at the Finish Line Festival were too much for me. When she arrived to pick me up, Little Miss ran up to me, saying, “Congratulations!” And, really, that was even better than the medal. And I beat my co-worker’s time by about 4 minutes, although I never saw him, because he started a few corrals ahead of me. Isn’t chip timing fun?